"Soul Static Sound starts the new year with a concise and direct release, which exemplifies a minimalist approach to both making and listening to music. Mapstation is Stefan Schneider's first solo recording, a mini album which draws on his experience as a member of To Rococo Rot combined with the melodic and moody sensibilities inherent in the musical heritage of his native Dusseldorf. Working on the shapes of sound whilst avoiding the limitations of formalism allows the rhythms and textures to express themselves to the listener as a process of subtly changing relationships. Evocative electronics through clarity and constraint. File next to good German minimal techno/electronica labels such as Din, Chain Reaction, Basic Channel, Kompakt, etc." 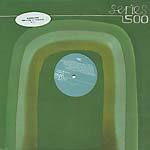 Classic 2000 release on this now defunct label; last copies, reduced price.